Last week, a new atlas was released documenting the network of pan-Inuit trails crisscrossing the Arctic from Alaska to Greenland. 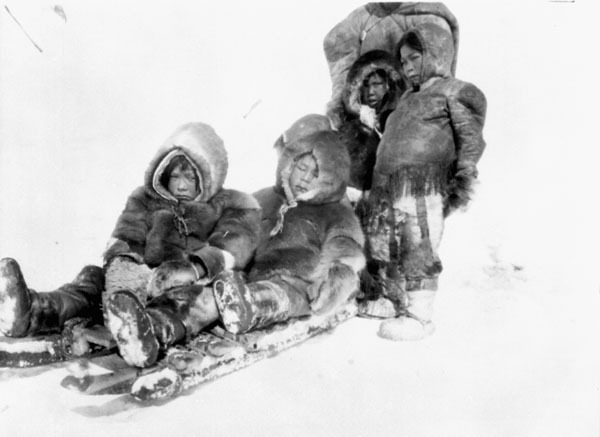 Historically, these trails – crossed by sledge, dogsled, foot, and kayak, to name a few methods of transportation – have connected communities of Inuit to one another. They have also connected Inuit to populations of migratory animals, which they have hunted for survival. 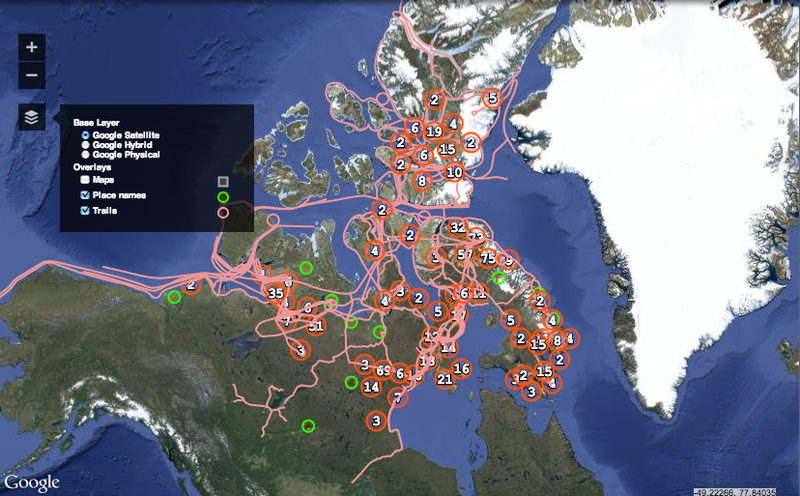 By showing the region as a networked, inhabited, and named space, the atlas challenges common imaginings of the Canadian Arctic, which typically portray a harsh and unpopulated archipelago difficult to travel across even through the Northwest Passage – the most widely known regional transit route. “The famed Northwest Passage—a direct shipping route from Europe to Asia across the Arctic Ocean—is ice free for the first time since satellite records began in 1978, scientists reported Friday. The Pan-Inuit Trails Atlas reveals the Northwest Passage to be only part of a more expansive system that extends east, west, and also along north-south lines. The trails go as far south as Freshford Lake in central Manitoba, at 53°N (about the same latitude as Cambridge, England), and as far north as Ward Hunt Island, off the north coast of Ellesmere Island, at 83°N. This is nearly the same latitude as the northernmost tip of Greenland. 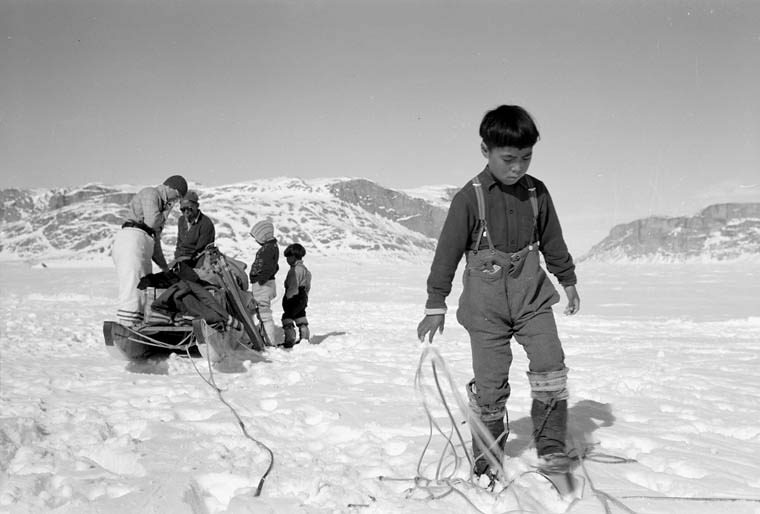 An Inuit boy preparing to set up camp in White Bay, Eclipse Sound, North West Territories, with the mountains of Baffin Island in the background. 1952. © Library and Archives Canada. Thus, Ward Hunt Island and the larger nearby Ellesmere Island were figuratively detached from their roles within the Inuit trail network and instead instrumentalized as geostrategic parcels of land during the Cold War. Ward Hunt Island was no longer a site for land-based transit, but rather one meant to enable military aviation across thousands of miles. These perceptions still dominate many of today’s perceptions about the Arctic. The region is seen as a macro-scale geopolitical chessboard in which the pieces being moved are ships, cargo, hydrocarbons, and aircraft, rather than a more micro-scale view involving individual people going about their day-to-day lives just as we might think of the lived streets of London or Paris. Geographer and photographer Trevor Paglen contends, “The drone creates its own “relative” geographies, folding several noncontiguous spaces around the globe into a single, distributed, “battlefield.” Contrails in the air and submarine wakes in the water came to dominate ideas about movement in the Arctic during the Cold War – not the icy, snowy, and watery tracks of Inuit movement. 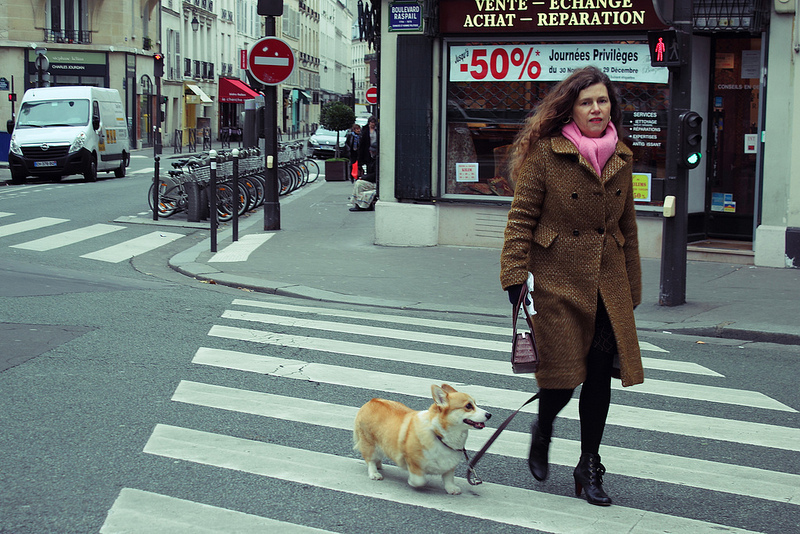 People in Paris walk with their dogs to get around, and it’s no surprise. So do people in the Arctic. © Mia Bennett, 2012. It is worth investigating why these perceptions of the Canadian Arctic as a space for enforcing sovereignty endure. Many other places which were highly militarized during the Cold War have managed to move on: think Berlin, for example. Certainly, the Berlin Wall still looms large in perceptions of the German capital, but the nightlife, arts scene, kebabs, and currywurst are just as prominent. In Canada, Prime Minister Stephen Harper has unflaggingly promoted the Northwest Passage as a shortcut to northern economic development and Canadian sovereignty. In 2006, he expressed, “The Northwest Passage is becoming more accessible every year: Some scientists even predict it will be open to year-round shipping within a decade.” Three sentences later, he continued, “It is no exaggeration to say that the need to assert our sovereignty and take action to protect our territorial integrity in the Arctic has never been more urgent.” Current Arctic Council Chair Leona Aglukkaq has made strides in putting the people back into the Canadian Arctic, but especially for Canadians living in the south, the idea of the Canadian Arctic as a vast and uninhabited space remains. The Pan-Inuit Trails Atlas, which overlays the network of trails onto the thoroughly modern, Western tool of Google Maps, serves as an important tool to counter such misguided notions. The atlas was mostly made using publicly available historical materials, and when you click on a trail using the interface, the original source, often an old map, is visible. And to bridge the past with the present, afterwards, it’s fun to navigate to Google’s very own “Streetview” of Iqaluit and other parts of the Canadian Arctic. So when you next hear Stephen Harper proclaim that the Northwest Passage may soon be open to navigation, just remember that the Inuit have been navigating the Canadian Arctic Archipelago for over a thousand years. Inuit on the go… most of the time! Taken in the 1920s in the Northwest Territories. © Library and Archives Canada.